Ender is a third child born in a time when the population is strictly controlled. Most families only have two children, but Ender's family is allowed a third so they can try one more time to have a child qualify for Battle School. Ender's older brother Peter had shown promise but was too violent, while his sister Valentine was equally smart but too compassionate. The government hoped Ender would be a mix of his siblings and succeed where they did not. As it often does, the future of humanity rests on children but in Ender's world it's a bit more literal. Children are being raised as military geniuses because they have the quick reflexes and skill to fight the alien invaders. 6 year old Ender passes his final test and enters Battle School determined to help stop the Bugger (alien) invasion. Ender and his classmates are "children" in age only. They are military men and women at an age when most kids are still picking their noses and forgetting to flush the toilet. They are violent and mean, and loving and kind. The book does a good job of showing the complete control the government has over them and how every single thing the commanders do to Ender is calculated and planned. Ender's school leader feels bad when he isolates Ender and steals his childhood, but never once thinks it shouldn't be done. The ends justify the means in all cases. This attitude trickles down--Ender feels bad when he hurts the kids who bully him but he often thinks he has no choice. 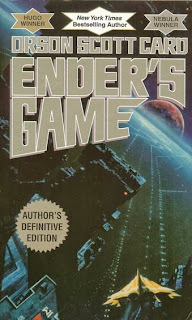 I enjoyed Ender's Game as both a science fiction story and a deeper commentary on war and the decisions we make when we are threatened. I've read the negative criticisms of the book and I think that most people have a hard time separating it from Card's political views. I don't think that this book is propaganda or a love letter to the military. Card does not depict the military advisors as being infallible. Overall, I enjoyed it. And yes, the book was a thousand times better than the movie.